An indigenous round-house deep in the Colombian Amazon. Parks Unit and Amazon Conservation Team. Recycled Minds has covered a number of "uncontacted tribe" stories over the years, so thought we would share the latest coming out of Colombia. So far, this story about what may be three different indigenous groups is a bit unique from the past stories we've covered. The previous stories came with some controversy, something to this point lacking in the Colombian story. In 2008, a group was filmed in the Brazilian Amazon and declared a "Lost Tribe", however the story stayed in the headlines as people declared it a hoax, and then later accepted that the group was just re-discovered after almost 100 years. (You can read about that story and check out some pictures on our posts from 2008 here and here). 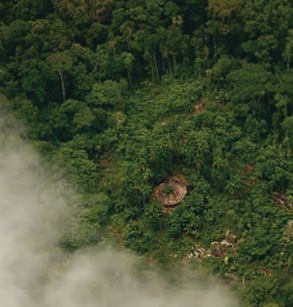 Next came a story in early 2011 from the Peruvian Amazon that claimed to be the first-ever video footage of an uncontacted tribe deep in the forest (Check out our coverage here). This story was significant for the fact that the indigenous group was under threat from illegal loggers operating in the vicinity. Both stories highlighted the difficulty such groups have in maintaining their autonomy and way of life free of outside influence. Brazil and Peru each have organizations charged with protecting the rights of such groups, but when faced with the relative power and influence of international logging and oil companies, their limitations are exposed. The State shall guarantee the rights of uncontacted indigenous peoples or indigenous peoples in voluntary isolation to remain in that condition and live freely according to their cultures on their ancestral lands. Therefore, as subjects of special protection, under no circumstances may they be stripped of their territories, or be subject to policies, programs or activities, private or public, that promote contact or realize interventions in their territories for any purpose. The groups were found in the 2.47 million acre Rio Puré National Park during a project that was attempting to determine if tribes were in fact living in the park. Now that groups have been located, the government will begin to define their territories, and develop plans to deal with accidental contact, specifically readying health resources. Rapid health response to first contact is vital to the survival of a group, as introduced diseases have decimated previously uncontacted populations. Groups in Colombia have unprecedented legislation in place to protect them from outsiders, and it will be interesting to see if that's enough to maintain their autonomy and survival.